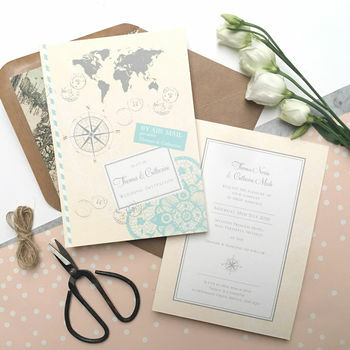 Stunning decorative travel themed invitations with a vintage twist. 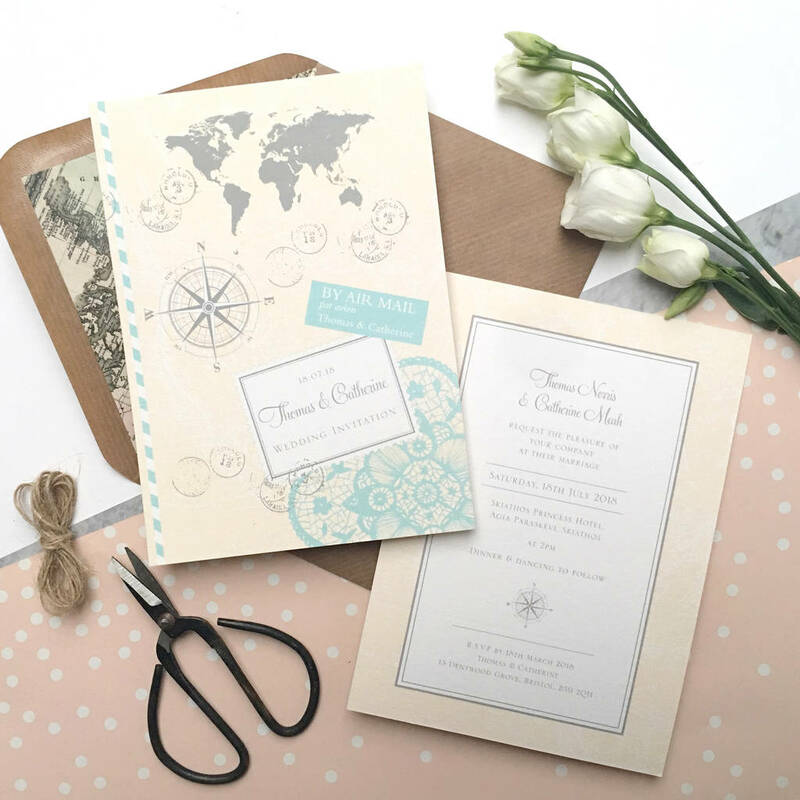 These wedding invitations are perfect for a wedding abroad, or the couple that love to travel! 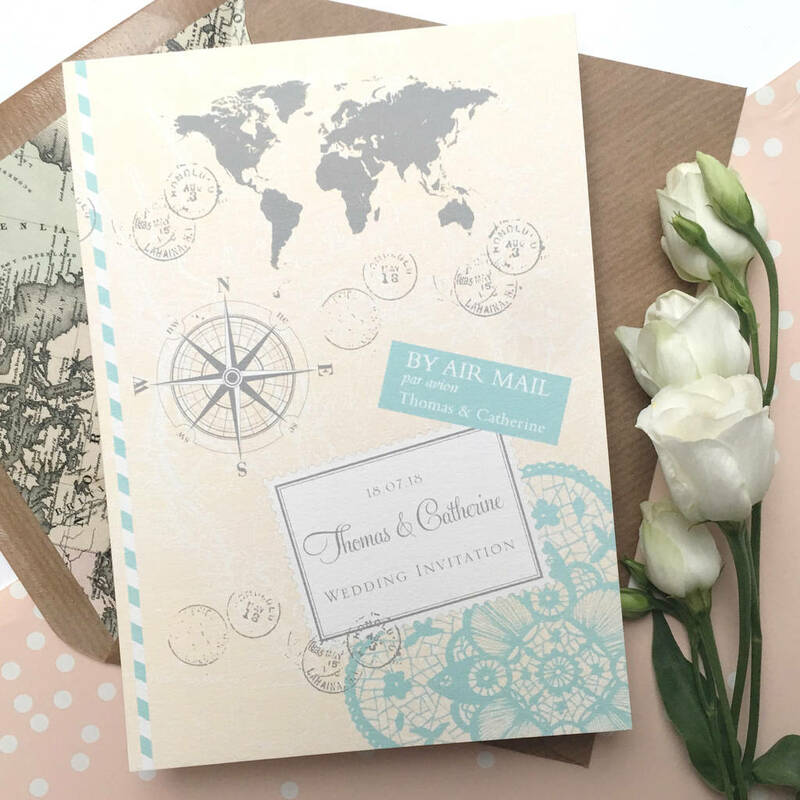 With unique personalised stamps and stunning and decorative travel elements, each travel themed invitation is fully personalised to match your unique colour palette. We have a selection of wording options for you to choose or if you would like to supply your own words, please let us know. 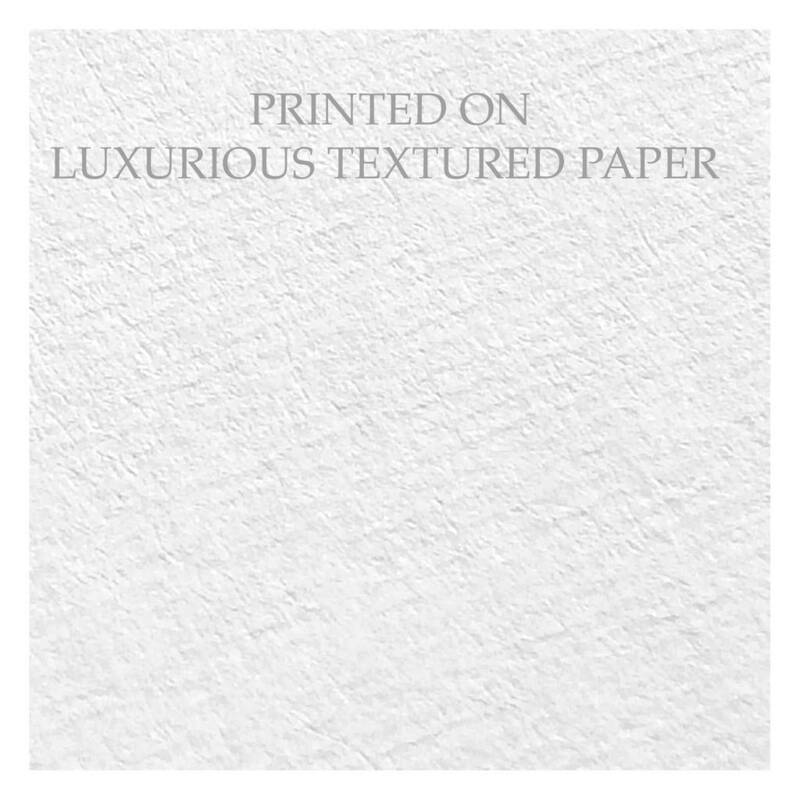 We print our invitations on the finest soft white card for a luxurious touch and have a choice of coloured envelopes to compliment your design. 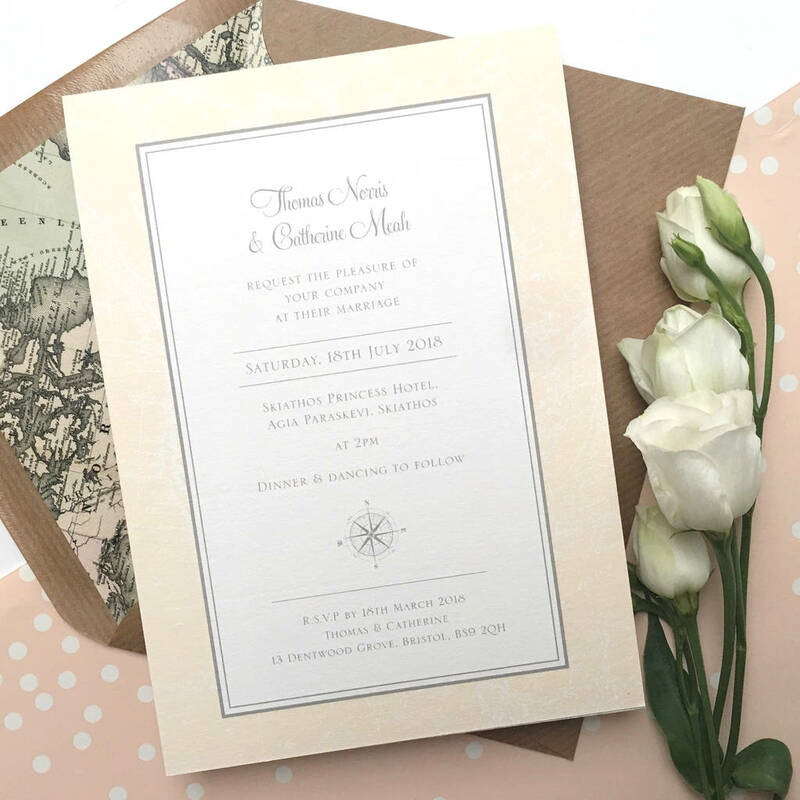 These fabulous invitations are supplied in a classic postcard style invitation - which is a single sided invitation that is printed front and back. Or a gorgeous card style which has your gorgeous travel design on the front, with your chosen invitations wording and design on the inside. We can even print your guest names on the invitations for a truly professional finish. In the selection box to the right, select the number of invitations you would like with guest names printed. You may want some printed and some blanks for keepsakes / spares so any other invitation in your order we will left blank for you to write the names in yourself. We will collect your guest list once the order has been placed. ***Please note, if purchasing samples, colours can not be personalised with your chosen colours as these are already preprinted. However on placing the order, we will send you digital proofs of your choice of colours. Once we have received your order, ditsy chic will get in touch by email within 24 hours (longer over the weekend) to collect the information required for your invitations. We will then send you a FREE personalised email proof of your invitation to ensure everything is perfect before we go to print. We also create bespoke wedding stationery designs and non-wedding occasions. For more information please use the 'contact the seller' button if you'd like to ask us any questions. This product is dispatched to you by ditsy chic.